Whether or not you registered for the Ride in the Rain Challenge with Cascade Bicycle Club, pull on your rain gear and take a 7.5-mile spin with the family! Since I’m not leading our regular Thanksgiving morning ride around Lake Union this year (but please, someone else, lead one if you’re up for it! ), we’ll do a similar ride…except we’ll start and finish out of the rain so just the actual riding is in the rain, not the waiting. You’re welcome! Meet at the MiiR Flagship (3400 Stone Way N, Suite 4, Seattle WA, 98103–in the Brooks building, entrance on Stone Way). Come at 10:30 (or earlier!) if you want coffee, snacks (including Mighty-O Donuts), and/or potties, because we’ll start the safety briefing and bike going-over at 11. 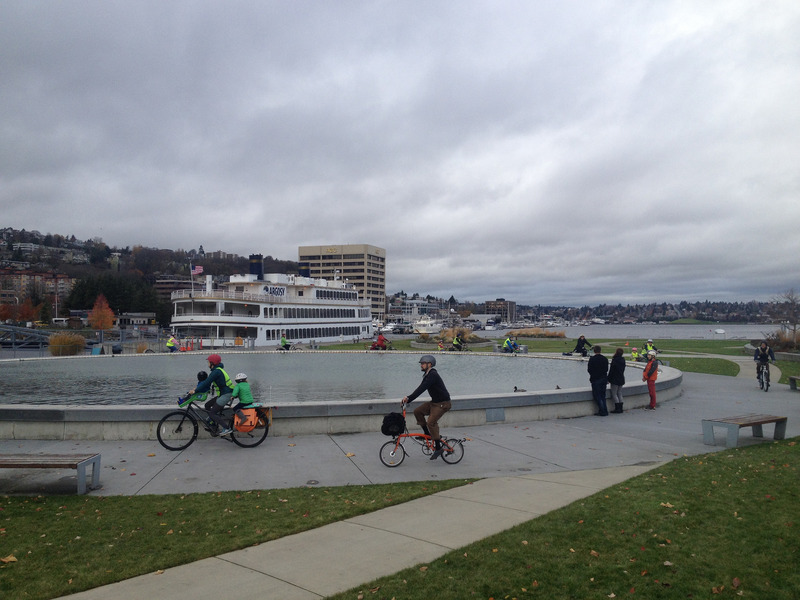 We’ll ride clockwise around Lake Union, and last year’s Thanksgiving map has details and photos. There’s one steep climb. We’ll stop a block before that and give everyone a warning and space ourselves out. It’s rideable, especially if you build up speed in advance. And, of course, it’s fine to walk up! If the rain is light and kids are in need of getting wiggles out, we’ll stop at the playground at Waterway 5/by Daniel’s Broiler. But this isn’t a planned stop this year–only if the weather and wiggliness of wee ones dictates. We’ll take the obligatory five laps around the model boat test pond in Lake Union Park and if anyone needs to use the potty, the MOHAI Compass Cafe will be open. 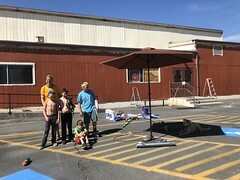 And then we’ll finish up at the Fremont Brewing Urban Beer Garden (which is right across the street from our start point). There are pretzels and apples, but if you want to stay for lunch, you can order it in from a book of menus or bring food with. It’d be nice to hang out for a bit and compare rainy riding stories and talk strategies for bundling up (especially bundling up non-pedaling kids) as the weather gets colder. 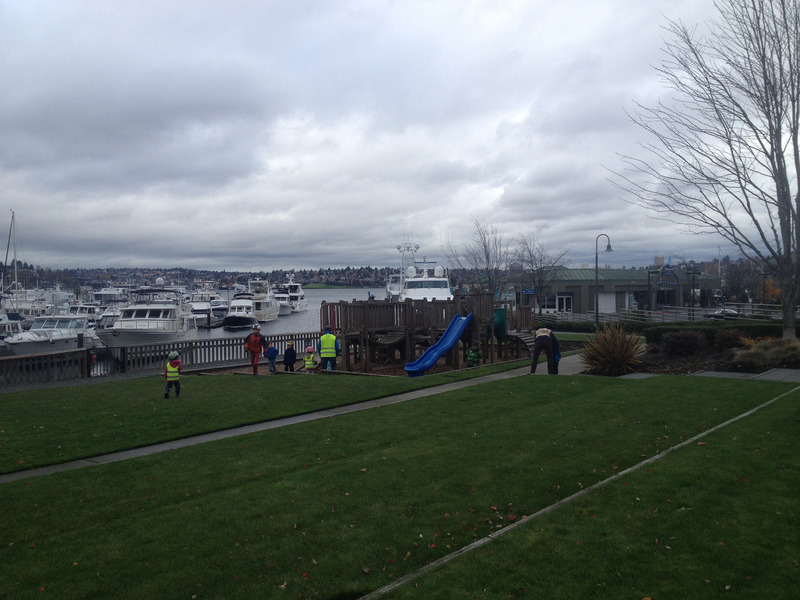 Note: Saturday November 28th is Greet the Season at Lake Union Park so some of us might have back-to-back Lake Union Park days. More about Kidical Mass Seattle.